A mixing of the toy worlds! Not only are Happy Bungalow toys mixing with those rascally store bought toys, but if you look closely you’ll see cars taking a snooze on some dollhouse beds. 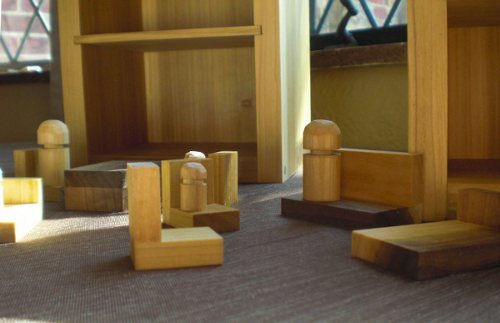 So here are some castle prototype parts, dollhouse bookend furniture pieces, a wood fairy, along with some old Legos of mine, and loads of toy cars. 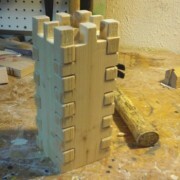 The castle is built from Castle Bookend prototypes that predate the official launch of Happy Bungalow. I wasn’t able to quite work out the mechanics of the castle. Maybe we’ll take another look at it some time. 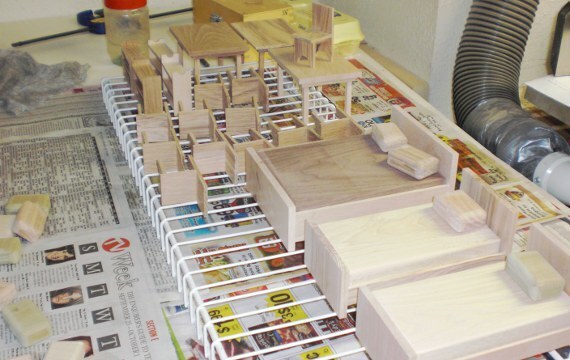 How is that cute kid-friendly dollhouse furniture made? 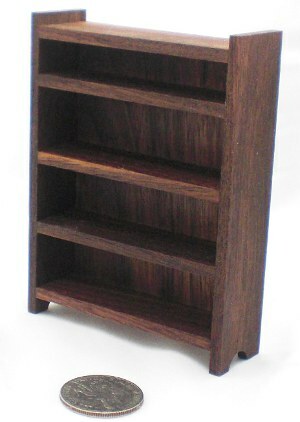 Not with stained basswood. 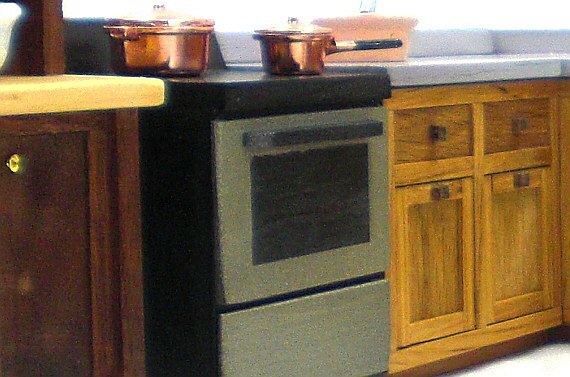 All of Happy Bungalow’s colors are natural wood. 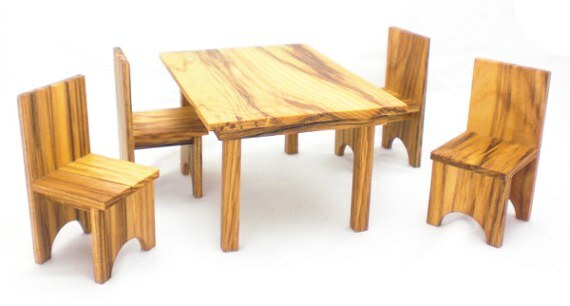 Miniature wood furniture starts with big pieces of wood. 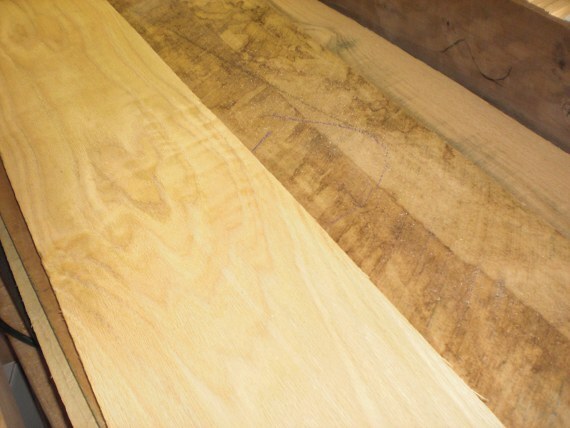 From left to right in the picture there’s hickory, red oak, maple, and walnut. 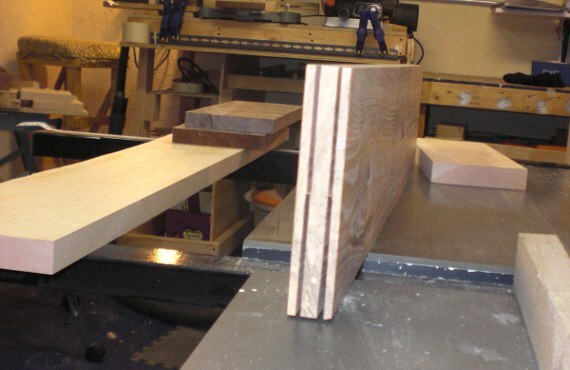 I joint and plane the boards smooth then slice the wood into thin pieces on the table saw with a shop-built resaw fence. It takes several passes to slice the boards leaving the wood a bit jagged along the cut. 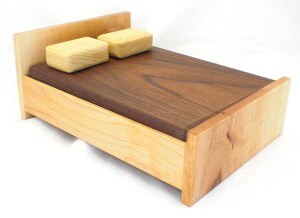 The new thin slices of wood are smoothed on a planer and thickness sander. 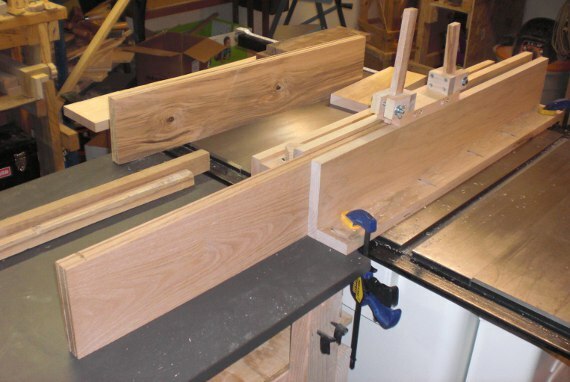 Smaller pieces of wood are made even smaller on the table saw (ripping the wood into thin strips) and miter saw (cutting strips into short pieces). 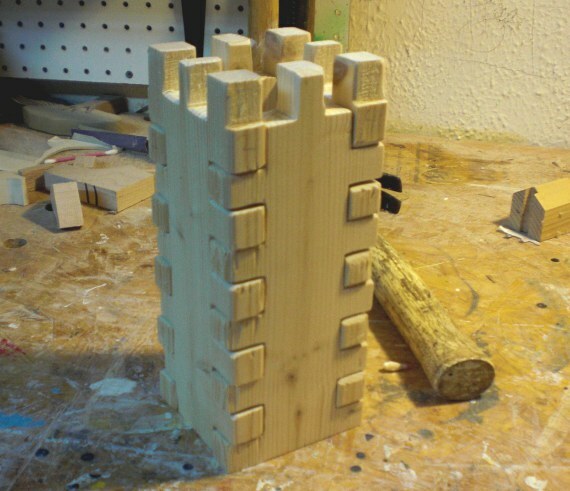 After some sanding they’re sorted and ready for assembly. 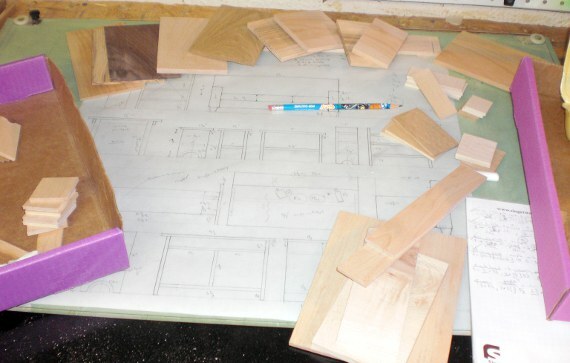 In the center of the picture you can see my full size drawings for these 1/12th size pieces of furniture. 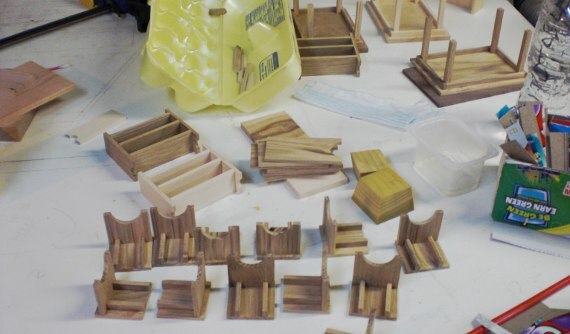 Below are some dining chairs during glue up. In the background are their companion tables. 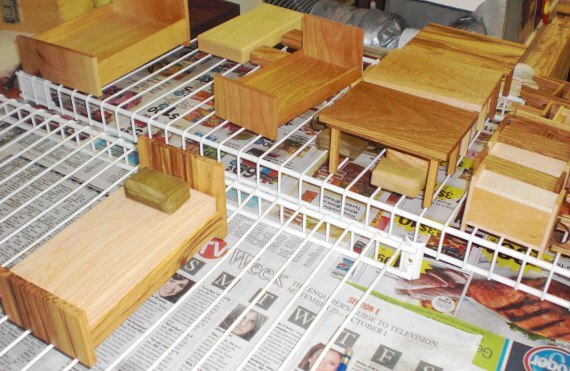 Half the chore at this stage is keeping all the pieces organized. The rest of the process is patience and a steady hand. 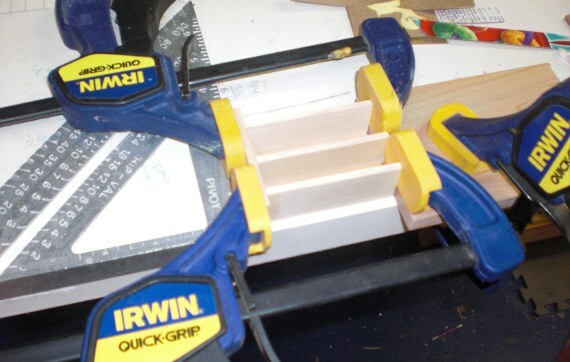 Full size clamps employed to hold together some shelves while the glue dries. I’m also a big fan of masking tape for clamping. 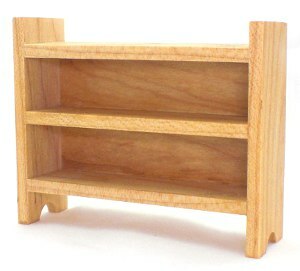 Beds, tables, chairs, and shelves are ready for finishing. Post finishing with linseed oil the grain and texture of the wood pops. More of the pieces for my friend’s 2 year old. 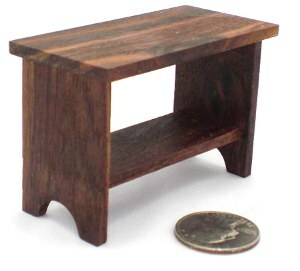 All pieces are twelfth scale (one inch scale). See some other pieces here. 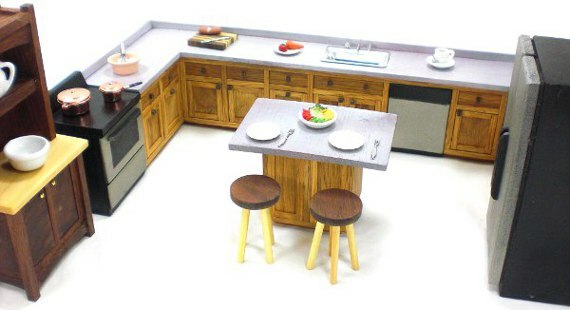 And see how this furniture is made here. 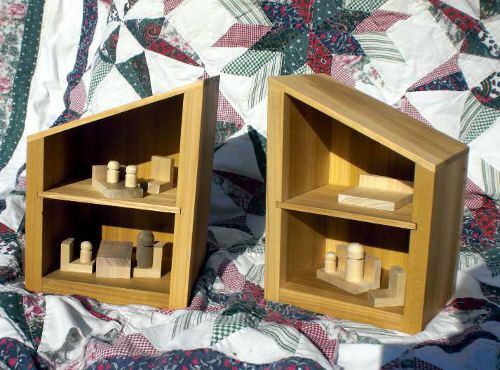 A friend asked me to make some furniture for her daughter’s inherited dollhouse. The little girl is two while the house has furniture designed for adults. 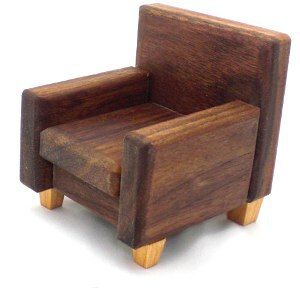 These pieces are better suited for children. 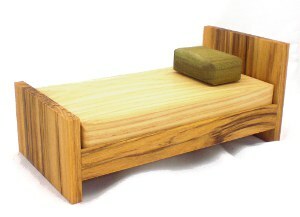 See how this furniture is made in this post. Not only was it my first show, it was my first day selling to the public as well. I was super nervous and for the past few weeks I’ve been focused on little else than the show. Months ago I planned to buy folding tables, but a few weeks ago changed my mind. So I made four wood tables that I could take apart for easier transport. I also made a sign, stands for the clocks, and business card holders. I wasn’t happy with the greenish buckets at the corners, but they kept the awning from flying away (bonus). I thought I could make some (nice) plywood containers and fill them with sand or concrete. We’ll see. At the finishing stage of the sign I had an accident and before I could do anything the accident dried. My wife couldn’t spot it, so maybe it’s not so bad. Along with the sign I put a sample of all the products on the table. Quite a few people stopped to look. 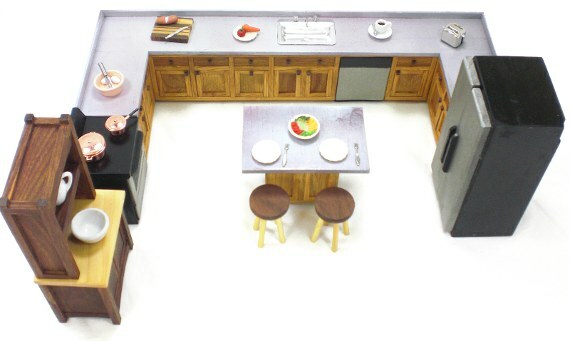 Everyone loves the cute dollhouses and the animals. People liked the knobs too. 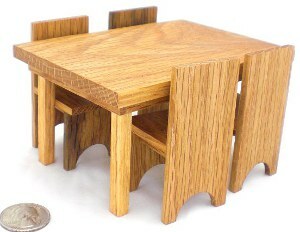 The tables were unfinished (not enough time) so the rest of the unfinished wood products blended into the table. My wife had the idea to put paper on the table – sort of like butcher’s paper. This worked well as I wrote descriptions of the product and prices on the paper. I like the concept, but I’d like to find a different color paper. 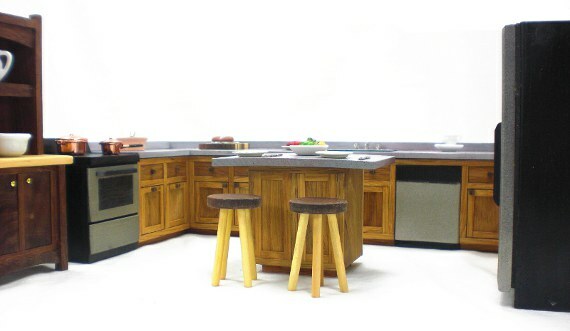 You can get a closer look at the tables – the legs are planed lumber and the tops are birch veneered plywood. They’re lightweight and universally interchangeable. The animals were a big hit – especially the walnut animals. I’ll be making more of those soon. This is where Happy Bungalow’s first sale came from. Not a dollar, but a twenty – I’ll frame it anyway. A super sweet lady at the next booth came over to congratulate me. I made more sales later, handed out business cards, and talked to a lot of people. I can’t wait for the next show.